Good Food and Playful Design is Restaurant Bon, Paris. Strolling through the 16th arrondissement we walk along blocks of apartments looking for our restaurant for today. 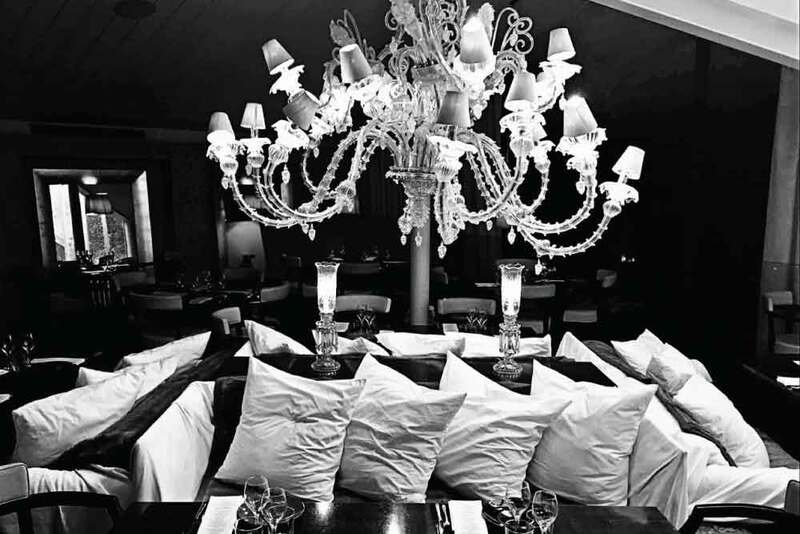 The area is not particularly busy with shops or restaurants so when we walk by the large glass windows framing white dining tables and chairs we know we have arrived at Restaurant Bon. As we enter, the space is unmistakably Philippe Starck. The attention to detail, texture, tone, light and scale somehow creates a space that feels surreal but comforting. The warmth of faux fur rugs stretched on cosy sofas with big white cushions, woven leather handrails on the stairs and soft light pooling from low hung lampshades, is comforting and cozy. The giant white chandelier and large silver framed floor to ceiling mirrors leaned against walls remind me how small and insignificant I am in the vastness of the world. Another strange sensation in Paris, is that of space. Tables are not cosied up to each other but spread wide apart on black glossy floors, creating the illusion that everything is floating. Rather than being an alienating experience I find the space liberating. My presence there is inconsequential I could pretty much be invisible, so there is no hesitation in ordering exactly what I want, who’d notice or care? The menu is also surreal for me, why am I eating Asian influenced food in Paris? There is no particular Asian cuisine dominating the menu there is curry, sweet and sour, sashimi. There is foie gras of course but this time with a spicy mango chutney. We order two fusion dishes for starters – salmon tartare mango and avocado and salmon new style which is sashimi with a fruity little dipping sauce. For main, stir fried beef and fish cooked in a palm leaf. Dessert chocolate fondant and panna cotta. I’m still feeling peculiar about the confusion of French Asian fusion. French technique, served as separate plates rather than in the Asian shared style, and flavours influenced by Asia. But I’m not quite sure it worked. The food was tasty and very enjoyable but it was the experience of being in that surreal space that was most joyous for me. I could have stayed for hours, there were so many little details to notice. Another example of the magical wonder I find in Paris.